In an earlier article I indicated that, contrary to worldwide expectations — especially in Africa— President Barack Obama would spend a considerable portion of his first term in office addressing domestic economic problems. In the same article, I maintained that Obama could make his mark on Africa by taking specific steps to address the continent's development needs. One of the most intriguing possibilities for the Obama administration is the unlimited potential to mobilize and engage Africans in the Diaspora for that purpose. Who are Africans in the Diaspora? This is not a trivial question. Considerable controversy exists over the definition of Africans in the Diaspora However, the African Union, through an independent continental meeting of experts, concluded that: "The African Diaspora consists of peoples of African origin living outside the continent, irrespective of their citizenship and nationality and who are willing to contribute to the development of the continent and the building of the African Union." The African Union also tacitly designated Africans in the Diaspora as the organization's "sixth" region. In 2004, I noted with some colleagues in another article that the Diaspora includes black populations in North America, Latin America, the Caribbean and Europe. A former top official of the United Nations in 2006 discussed the "old" Diaspora, consisting of individuals and families "involuntarily" taken from their homelands in Africa to the Western Hemisphere more than 250 years ago. The "new" Diaspora is comprised of individuals and families who "voluntarily" moved to the West, post-World War II. In developing an effective agenda, Obama will have to deal with two operational issues. First, his administration will have to address the domestic needs of the Diaspora population in the United States so that they can effectively advocate and mobilize to aid in Africa's development. Second, ways will have to be found to understand and deal with the Diaspora's concerns relating to Africa. These two distinct, operational issues are at the core of past failures to mobilize Diaspora communities for African development issues. The Obama administration will have to set the machinery in motion to simultaneously meet the domestic priorities of African-Americans, Afro-Latinos and African immigrants and take specific steps to address their long-term concerns for development issues in Africa. The Diaspora community will have to make strides on domestic issues by gaining better access to education opportunities and facilities for their children, quality and timely health services, financial credit and housing finance facilities, rural farming services, strategic decision-making positions in government, small and medium business loan services, and by providing protection from environmental degradation and brown fields. Establish current policies and programs on Africa, from executive action decisions to legislation and implementation plans. Determine potential gaps in current policies and programs on Africa and present scenarios for fixing those that are identified. Provide a blueprint outlining the parameters of an integrated and comprehensive inter-agency United States strategy, policy and programs for Africa. Present a roadmap on how Diaspora members can play specific, verifiable roles in the implementation of the United States strategy, policies and programs in Africa. The review should include public, private and civil society technical representatives as well as Diaspora organizations. It should also include staff members from Congress, members of the U.S. Foreign Service, current and former ambassadors to Africa, as well as think-tank and academic subject matter experts. Upon the completion of the review, the Obama administration should organize regional meetings with Diaspora organizations and other interested entities to discuss the blueprint and how best to implement the proposed activities. Once feedback is received from stakeholders around the country, the administration should refine the United States strategy, policies and programs for Africa, where applicable. With a refined plan a White House conference on Africa should be organized. The proposed White House conference should focus on three objectives. First, it should review the United States strategy, policies and programs on Africa to ensure that they meet both national strategic interests and the development priorities of Africa. Second, opportunities should be provided for government, private and civil society representatives from Africa to give insights and input on development priorities in the continent and how best to address them. Third, operational modalities could be developed on how Diaspora communities can play specific roles in the implementation of the strategies, policies and programs in Africa. Four specific "Achilles heels" of Diaspora issues should be addressed, including the need to better organize the activities of Diaspora organizations; the need to strengthen continental and regional institutions in Africa so that technical expertise from the Diaspora could be better channeled to meet development priorities; the need to address the sometimes cat-and-mouse relationship between Diaspora organizations and governments of some African countries, especially in the areas of human rights, political plurality, economic freedom and governance reforms; and lastly the need to address upfront the potential conflicting priorities between "old" and "new" Diaspora communities. The White House conference should conclude with broad outlines of monitoring and evaluation benchmarks, which should be reviewed and released publicly on a regular basis. The gathering should take place at least once every four years to provide credible, bipartisan, and transparent opportunities to review the United States policies toward Africa. President Obama, as the first African-American leader of the United States, carries a special global burden of not only ending the American recession but also leading the way in dealing with global economic woes. The son of a Kenyan father, he has the weight of extraordinary expectations among Africans in the Diaspora, and in Africa. 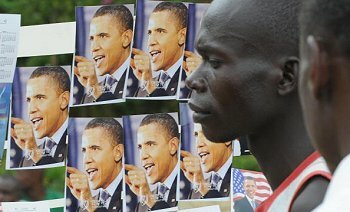 The Obama Administration should create verifiable avenues for Diaspora members to actively participate in the implementation of United States policy to Africa. In a forthcoming article, I will address specific technical and operational areas where the Diaspora can have a major impact on Africa's development.